Dr. Kazi one of the first to use an Innovative, New Technology to Protect Heartburn, Acid Reflux and Barrett’s Patients from the Most Rapidly Growing Cancer in the US. 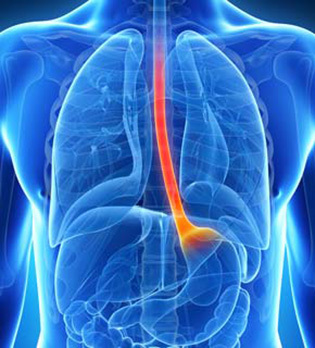 Esophageal cancer is the fastest growing cancer in the United States. It is also one of the deadliest. Once diagnosed, only 17% of patients live for five or more years. The good news is that due to a recent advance in the detection of still-harmless precancerous cells, esophageal cancer is now potentially preventable. Dr. Jaffrey Kazi of Arizona Gastrointestinal Associates has added WATS3D to the upper endoscopy for patients with upper gastrointestinal disorders such as chronic heartburn, also known as gastroesophageal reflux disease (GERD). Patients with GERD are at an increased risk of developing Barrett’s esophagus, a condition that can develop into esophageal cancer. Because WATS3D has been shown to be far more effective than the standard biopsy, the addition of WATS3D to the endoscopy significantly increases the detection of esophageal precancer. Standard biopsies are effective when the doctor can see the area of abnormality that requires testing. For example, precancerous cells in the colon are usually limited to polyps that can be seen (and removed) during a colonoscopy – thus preventing colon cancer. visible and a doctor therefore doesn’t know exactly where in the esophagus the precancerous cells might be located. Current standard biopsy procedure calls for taking small, random forceps biopsies which test only a very small fraction (about 3%) of the esophagus (see diagram), while potentially missing a great deal of still-curable precancerous disease. 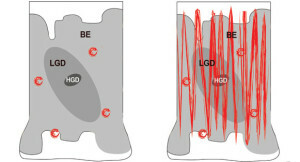 WATS3D overcomes this problem by using a biopsy brush that both sweeps a wide area and reaches the bottom of the epithelium (see diagram). (WATS3D stands for Wide Area Transepithelial Sample with 3-Dimensional Tissue Analysis). This results in a tissue sample that is 50X thicker than a standard forceps biopsy and cannot be analyzed by a standard microscope. Utilizing proprietary technology, WATS3D computer imaging electronically slices the specimen into over 100 one-micron thick optical slices and integrates them into a single 3D image with every cell on the slide in focus. This 3D image presents a view of the gland never seen before. In addition, the WATS3D scanner identified and highlights the most suspicious cells and cell clusters in the specimen. 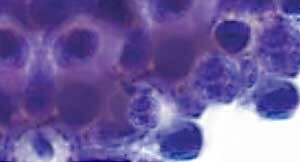 These 2 advances provide the pathologist with even more diagnostic information. For more information on WATS3D visit: www.wats3dforme.com.